Vinyl full zip closure, 2 outside ( a zip closure each) pockets, removable hood (snap buttons), shell body lining 100% polyester, hood trim faux fur 46% modacrylic 39% acrylic 15% polyester, filing 100% polyester, fleece inside, clean & great condition. HAS A REMOVABLE, FAUX FUR HOOD. POLYESTER - MADE IN CHINA. COLOR IS LIGHT BLUE. STATES AS OF THIS DATE ARE: MN, WA, IA, CT, NJ, AL, OK, & PA. IMPORT FEES WILL APPLY FOR THE COUNTRY THE ITEM IS BEING SENT TO. 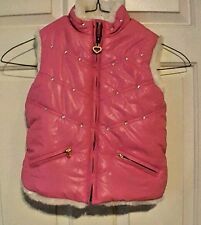 You Are Viewing "The Children's Place" Pink Studded Puffer Reversible Soft White Faux Fur Silver Tinsel Glitter Vest Size S 5/6. There is also "bling bling" studded sparkle "jewels" on the puffer side and sparkling silver tinsel on the reverse faux fur side. Children's Place Light Blue Puffer Vest. 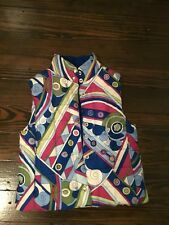 Super cute girl’s quilted vest from The Children’s Place in a size 5/6. Primary colors are royal blue, hot pink, white, and green. This looks like it is a Pucci inspired print. Great condition of item. Barely worn. No stains or tears. Vest also comes from a smoke free home. Color: Cheetah Print browns and beige. Material: polyester/fleece/faux fur. poly lined body. Machine wash: yes. sequined front. Removable/zip-off hood. Two zipped POCKETS. Zipper down. Euc TCP Faux Fur Vest. Looks great over a graphic T or dress. Size: Girls M 7/8. Personal checks are NOT accepted. Looks great over a graphic T or dress. Size: Girls L/XL. Very puffy and thick. Nice and soft and puffy. Girl's Reversible Vest. White/cream faux fur with sparkles on reverse side. by The Children's Place. Gold with sequens on one side. In excellent pre-owned clean condition. Back length: 17" from back of neck to bottom of tail. Rear shoulder to shoulder seam: 11". Front chest: 14" Underarm to underarm (not doubled). Condition: Excellent! Clean with no sign of ever being worn! The Childrens Place silver vest. Size 5/6 girls. Missing the zipper part, see last pic, can be fixed easily. 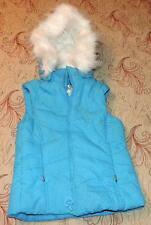 Children's Place, girls jacket vest, girls L 10/12, blue, hooded, sparkle. Reversible Puffer Vest. Machine wash. Chest: 16", armpit to armpit. Length: 19", from shoulder. This item was lightly worn. FIRST for what we can do to fix your order before opening a case. WILL NOT be changed after item is paid for. The material is 85% Acrylic, 15% Polyester, 100% Polyester, 55% Cotton, and 45% Acrylic. 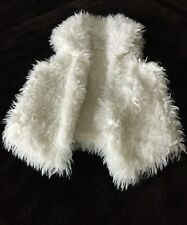 euc TCP Childrens Place FAUX FUR VEST White Fur and Silk Girls L 10/12. Condition is New with tags. Shipped with USPS Priority Mail. With rhinestones and 2 front pockets. Faux fur side is white and blue. Very fashionable and feels soft. 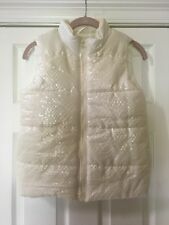 The Childrens Place 1989 Ivory Sparkly Puffer Vest Full Zip. Color: Ivory / Off White. Collar to Bottom Edge: 22". Across Chest: 17". Girls Children's Place Pink Hearts, Peace & Stars Vest. Pink with Hearts,Peace sign & Stars; zipper front, 2 front pockets. Is 3T would fit till 4. Super warm. Great shape! 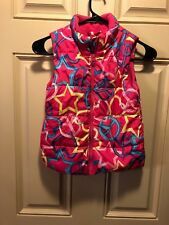 Childrens Place Pink Puffy Hooded Vest XS Size 4. Hood is removable via snaps. Condition is used. Will ship first class. The Children's Place Girls Sequin White Vest Lined Zip-Up. Having a Closet Clean out for my Daughter. This shirt is in good condition Shirt has no holes or stains See pictures ! Comes from a pet free and smoke free home Size is kids 14 xl Thank you for looking! Follow my store for more great items! 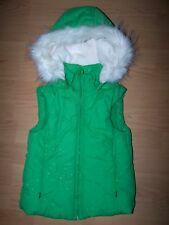 The Children's Place Girl's Winter Vest Size S 5/6. Pink, Red, White and Green. Length 16". Two side hidden zippers. SIZE 14 XL. 100% POLYESTER. 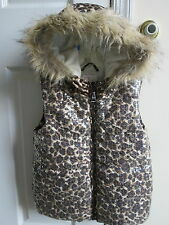 TCP The Children's Place Girls Black Sparkles Puffer Vest. Color is pink. Good preowned condition. Fleece on the inner side and nylon on the outer. Machine washable.